With nearly 2,000 years of cultivation by humans, the pumpkin has emerged as a fascinating crop with many wonderful qualities. Delight in their many uses by discovering how to grow pumpkins below. Pumpkins are currently harvested on every continent besides Antarctica. Temperature, soil quality, plant population, and genetics are just some of the factors that influence their growth patterns. The following growing guidelines will make easy for you to cultivate pumpkins at home. Pumpkins thrive in nutrient-rich soil that is well-drained and loose. A high content of organic matter from certain composts, manures, or fertilizers will provide the necessary nutrients for fruitful plants. In addition, a pH of 5.8 - 6.8 is recommended. Growing pumpkins requires direct, abundant sunlight and warmth, with temperatures ranging from 75 - 85°F (24 - 29°C) during the day and 60 - 70°F (16 - 21°C) at night. Plant damage can occur at temperatures below 50°F (10°C), while frosts can be lethal. For best results, sow pumpkin seeds in one to two inches (2.5 - 5.0 cm) hills that form neat, even rows of about six feet (180 cm) apart. Plant about four to six seeds per hill. Within each row, mounds should be separated by about 1.5 - 2.0 feet (50 - 60 cm) to allow greater intake of sunlight while lowering the chance of crowding. With regards to when to plant pumpkins, locations with year-round warm temperatures don't have a specific season, but in temperate climates, the best time for growing pumpkins is right after the cold season, in late May or June, when frost is not a threat. Early planting may cause them to soften and rot. Growing a pumpkin plant indoors can be a delicate matter, advised only in colder areas. Three or four seeds can be planted in small, three-inch (8 cm) pots placed near a sunlit windowsill for several weeks. In the absence of natural light, a fluorescent lamp and heating pad can encourage normal growth. Soil should be maintained at a damp level, but by no means wet. Germination will occur within two to three weeks' time. Each transplant will have about three or four mature leaves and well-built roots. Reduce water and temperature before transplanting. Then, following the same spacing guidelines as with planting pumpkin seeds outdoors, transplant the seedlings into the garden, taking care not to damage their roots. Though pumpkins are capable of withstanding dry conditions, extended periods of drought will adversely affect the size and growth of the fruits. Conversely, over-watering of pumpkin plants is also possible and may lead to disease and rot. For best results, deep, infrequent watering or irrigation methods are advisable - about 1.0 - 1.5 inches (2.5 - 4.0 cm) per week. Mulching the surrounding surface area of the plant will also help to preserve the amount of moisture in the soil. As fruits ripen, slowly reduce the amount of water. Pumpkins respond well to some all-purpose fertilizers and nitrogen fertilizers, which should be applied both before planting and as a side-dress once the vines have developed runners. Since they grow rampantly and require a lot of space, pumpkins are highly susceptible to overcrowding in the field. Overpopulation causes small, underdeveloped fruits and may lead to other kinds of trauma, which can force the plant to self-abort. One of the best ways to control overpopulation early on is to thin out the plants as they grow. When the newly formed plants are well-developed, thin out each mound until there are two or three plants left on each. Keep the best-looking or fastest-growing pumpkins, according to individual preference. Finally, use pruning to remove diseased fruits and other plant parts that are capable of spreading out and infecting other pumpkins. 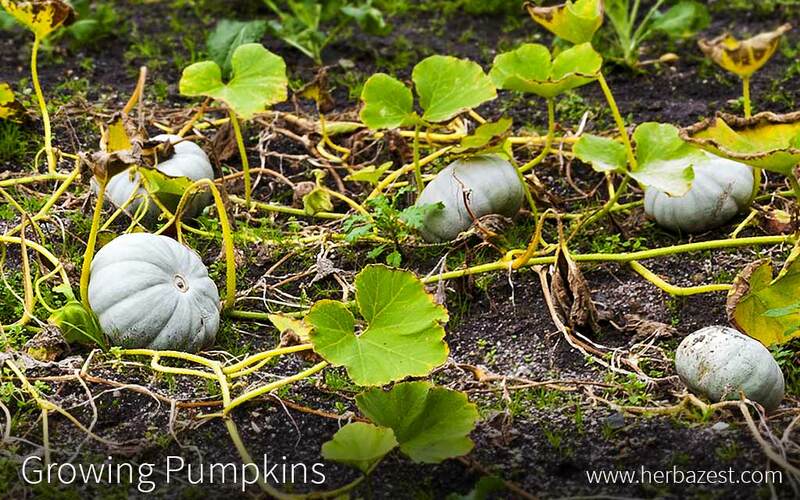 As they begin to spread out, pumpkins will naturally tend to block the formation of many weeds. However, in order to prevent and inhibit the growth of invasive weeds, apply mulch to your pumpkin garden. Hand-weeding and hoeing are also recommended forms of control, and herbicides may also be helpful, depending on growing preferences. Though only a few serious pest- and disease-related complications affect pumpkins, learning how to protect them is an essential part of growing pumpkins. Squash bugs and cucumber beetles are known to cause holes and wilted leaves and vines. These insects are a threat to the pumpkins' vines, seeds, and fruits. While squash bugs can be manually trapped and destroyed, cucumber beetles require the application of pyrethrin-based insecticides. Additionally, forming mounds around the plants can help to prevent the insects from laying eggs. Other common pumpkin garden pests include whiteflies, aphids, and spider mites. The formation and spread of powdery mildew is perhaps the most common type of pumpkin illness. This mold-like growth occurs when leaves and other above-ground plant parts are exposed to water or prolonged periods of increased moisture. It adversely affects pumpkin's growing stages or kills certain plant parts altogether. To prevent powdery mildew, avoid wetting the foliage and overcrowding plants. It is advisable to water plants early in the morning to allow them to dry as quickly as possible during the day. Besides pests and diseases, hungry, wandering animals - like deer, groundhogs, and squirrels - find pumpkin fruits irresistible, and pose a threat to any pumpkin garden. Pumpkins are annual plants that grow from spring to fall in temperate climates. While pie pumpkins and mini pumpkins may be ready for harvest as early as August, most jack-o'-lantern style, medium-sized pumpkins will need close to four months before they are ready. Once the pumpkins have achieved a bright, even color and a hard outer shell, harvest them using hand shears or a knife. Make a clean cut from the vine, taking care not to bruise the fruit or damage the stem - pumpkins without stems will begin to rot within a few days' time. Discard all damaged fruits, transferring the rest to a spacious 80 - 85°F (27 - 29°C) storage area to begin the curing process. Curing is a two-week drying process which allows the stem and some minor abrasions to heal, prolonging the pumpkin's shelf life and lowering the chance of disease. Curing also hardens the pumpkin's shell and improves overall eating quality. Afterwards, arrange the pumpkins neatly on shelves, making sure to leave enough room so that they are not touching. Pumpkins store better in fairly dry areas of about 50°F (10°C). Some pumpkins have been known to last for up to a year in storage. Other methods of storing pumpkins may include canning or freezing them for later culinary use. From planting to harvesting, every pumpkin plant growth stage is a unique learning experience. Under the right conditions, pumpkins can grow to be a rewarding delight for all those who invest in their upkeep and care.